My youth was full of cartoons and comics: in all honesty, you could not pull me away from either of these forms of entertainment when I was young. Looney Tunes, Animaniacs, G.I. Joe, and Yogi Bear were at the top of my cartoon list. They were something to talk about—soap operas for the youth, as my mother called them. We had a chance to talk about the newest episode on the school bus and on the playground. Now, cartoons have graduated to a new degree of sophistication. With the onset of 3D technology, cartoons are a lot bigger, funnier, and more creative, in my opinion. A traditional cartoon is usually made up of many slightly different images, like a flipbook. 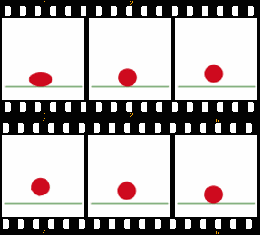 In this type of animation, each of these images is called a frame, and the rapid movement of these sequential frames results in the illusion of motion. If you were to put the six images/frames to the left together you would have an animated bouncing ball! Animation can be created by hand, by rendering, or by using three-dimensional objects, e.g., puppets or clay figures. 3D animation is a new monster and is created using graphic rendering by the animator. The process begins with something called a “mesh,”which is like a blueprint for the animator. The animator, at this point, has the ability to manipulate and modify the animation as he/she sees fit. This mesh is controlled using digitalized weights that allow for movement of the geometric figure that is based is reality! This process is called rigging, and during rigging the animator can inject movement into the animation using different techniques. Most of the techniques use mathematical functions: gravity, fur, hair and even things like fire can all be added using different techniques! 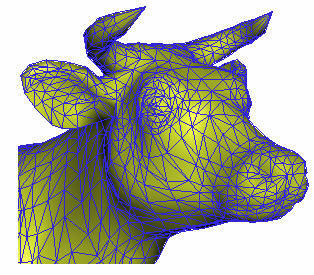 These techniques applied to the digital skeleton are all considered 3D dynamics. This process of rigging and applying 3D dynamics to characters and scenery is reproduced until you find an entire 3D digital world. Then this is all meshed with modern actors, music, and sounds to create these new 3D cartoons. Shrek 2 (2004) was the highest grossing 3D cartoon, with lifetime earnings of $441,226,247! That is a lot of money. 3D films and cartoons are going to continue to be produced. The most recent “Brave” and upcoming “The Rise of the Guardians” shows that 3D cartoons are not just for children, but for everyone. I have heard rumors of a “Popeye” production that will be rendered in 3D. That would take me right back to my childhood! In the meantime, check out some of the more recent 3D cartoons, and you will not be upset by the craftsmanship, storylines, or the visual illusions they are selling. You don’t say that cartoons are childish, I totally love them! What I would really like to see one day is 3D cartoons of Amanita Design. They have a very peculiar style. This must come out fine. What programs do I need to create 3D animation? You can use 3D Max or Maya, it depends on your choice. Not that there is any crucial difference. It’s only up to you to decide which one is better for your needs.